Part 3 : Multi-Period (5-Year to 10-Year) Rolling IRR of Lump Sum Investing for the STI ETF. Welcome to the 3 part in this comprehensive analysis of the Straits Times Index series! The last 2 parts were very well-received, I’m very glad that my detailed analysis were interesting for people to read. With that being said, I think that this 3rd part will also be of interest! Initial purchase price has a much bigger influence on the final returns compared to the selling price for Lump Sum Investing. Between January 2008 to January 2014, if your investment horizon was longer than 5 years, starting your lump sum investment at anytime within that window will always produce a positive non-inflation adjusted return. If we assume a 1.52% average rate of inflation (as per part 1 of our analysis) then lump sum investing in the above period would have produced a positive real return more than 90% of the time. So if you’re ready to find out how I arrived at these conclusions, you can read through the analysis below! The reason why we first dissected the returns of DCA because throughout most of our adult life – once we start working – we will likely rely on a steady stream of income that arrives through our salary each month. In order to invest money, we will likely budget a portion of our income in the “invest” bucket to save for the future. If we are good at controlling our expenses and following our budget, it’s likely that we have a consistent amount that we can invest each month. In effect, we will end up making investments monthly with roughly the same amount – effectively Dollar Cost Averaging into the market. In the previous 2 parts of this series, we’ve already taken a look at the return we would have potentially got if we started investing 11 years ago using the DCA method. There will be times in our lives when money does not arrive in a steady stream like when we receive our salary. Sometimes we are fortunate enough to have money arrive in one big chunk – like when we receive our Chinese New Year Ang Pao (if you have rich relatives and aren’t married), annual bonus, insurance payout, inheritance, winning the lottery, etc. These are certainly valid concerns. There is a possibility of buying right before a market drops, but it is also possible that you’ll buy before the market shoot up 100%. Often investors will pay too much attention to the down-side and forget the upside – this is called “loss aversion” and it causes investors to make bad judgement and invest irrationally. Although past performance does not guarantee future returns, it is a good indicator of the behaviour that we can expect. This why it’s important to take a look what the returns of Lump Sum investing would look like if we had invested in the STI ETF in the last 11 years. Since with Lump Sum Investment, we are only going to be buying the shares once, reinvesting all of the received dividends into the STI ETF, and selling only once at the end, the initial buying price plays a huge role in the final returns. This introduces a huge element of luck in the timing of the first purchase date – if the price happens to be really low when we first buy the shares, then we will have high returns and if the price happens to be very high, then we will end up with much lower returns. That’s not going to be an interesting finding. What would be interesting to know is how likely are we going to get a certain returns if we invested in one lump sum into the STI ETF during the last 10 years. In order to calculate this, we need to remove the element of luck that comes from selecting the correct day to invest. This is where our friend Rolling Returns Analysis comes in. The rolling returns analysis simply means we will be calculating the IRR for all possible starting dates between January 2008 to January 2014 for 5, 6, 7, 8, 9 and 10-year investment horizons – all while reinvesting dividends whenever they are paid. This should give us a total of 258 different IRR values, which will allow us to see that, out of 258 possible IRR values, how many of those are higher or lower than a certain return value. So what does the 5-Year Rolling Returns look like? The 5-year rolling IRR for lump sum investment into the STI ETF for investment start dates from January 2008 to January 2014. Wow, see that lucky person there around March of 2009? That’s when the market hit bottom from the 2008 financial crisis. The SPDR Straits Times Index bottomed out at S$1.27 per share then. If we were that person – used all of our money to buy the STI ETF in March 2009 and reinvested all of the dividend – after 5 years (ending in March 2014) we’d have an IRR of more than 20% per year! The lowest IRR that you see for the 5-year investment horizon is a little over 1% year-over-year return for the window starting in February 2011. However, we are all long-term investors here, so let’s see how this chart looks like for the rest of the investment horizons. One thing that I’d like to see is whether similar observations will be made for Lump Sum Investing when compared to rolling IRR of DCA in the previous post. The returns follow much more closely to the price graph of the STI ETF as Lump Sum Investing makes the majority of the share purchases up front; the initial purchase price plays a massive role in influencing the final outcome. We don’t see as much spread in returns over time compared to the same chart for DCA. As the investment horizon increases from 5-year to 10-year, the variance in returns – the difference between the maximum return and minimum returns – reduces. You can see this by observing that the longer time horizons have lines that are flatter in general than the short time horizon investments. You don’t have to time the market precisely to get a great return. At any time the market is significantly below all time highs (between September 2008 and October 2009), if you have the opportunity to buy, you will have a high probability of great returns over the long run. The start of 2008 was a really bad time to start investing for all time horizon, but the 10-year investment window still produced almost a 5% IRR. 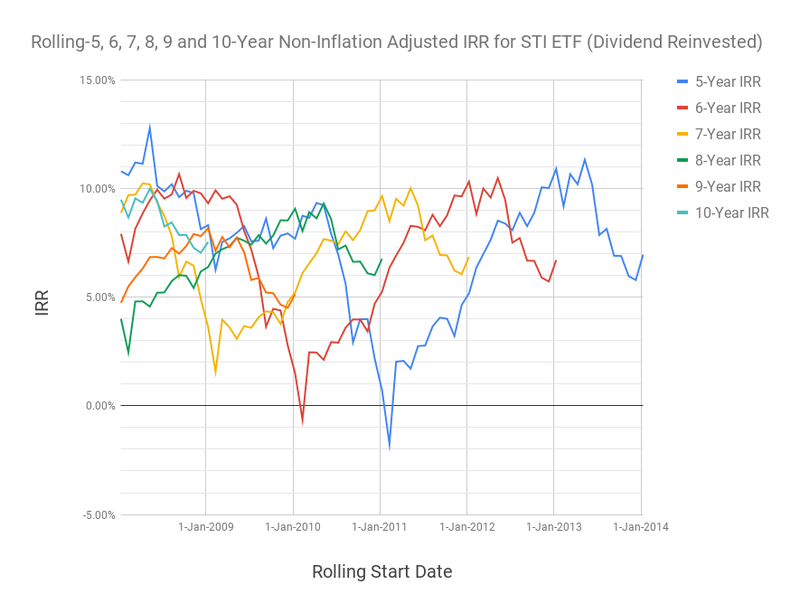 None of the investment horizons and investment start dates produced a negative IRR over the last 11 years. This is looking pretty good. There’s no negative returns, although we had some pretty low ones, but most of the time the returns were pretty high. However, we still don’t know what kinds returns were more likely. How do we figure out the likelihood of returns over the last 11 years? Since each dot represents the IRR for a particular investment window and starting date, we can also put this into a histogram. Each dot is counted and placed into an IRR rage to see how often each return rate occurred over all the samples. As you can see, there are outliers on the high side with 17% to 21% returns but the majority of the returns were concentrated between 5% to 9% returns. Adding the 5-Year column starting from the 6-7% row all the way down to the 20-21% row, you will get 69.86%. This means that 69.86% of the time, if you invested purchased the STI ETF and held it and reinvested the dividends for 5 years between January 2008 and January 2014, you will receive more than 6% return per annum. Pretty good. If you did the same for the 10-Year column, you will find that the percentage goes up to 84.62%. Although the numbers look great, this is also likely due to smaller sample size. Adding the 9-Year column from the 5-6% row all the way to 12-13% row, you will get 84%. Which means that 84% of the time, you would have gotten between 5% and 13% return per annum had you bought the STI ETF between January 2008 and January 2010. We can also see that – if we assume the average rate of inflation to be 1.52% – by adding the 1-2% row across, we can see that we would have produced that return less than 10% of the time. Which means that out of our samples of investment periods, we would have beat inflation more than 90% of the time. That gives me quite a bit of confidence. This is likely due to the high dividend rate of the STI ETF. So it looks like in the past 11 years, there was always more than 50% chance of earning more than 6% returns per annum, that’s pretty amazing. Keep in mind that if you can maintain exactly 6% p.a. return on S$10,000 for 10 years, you will end up with more than S$17,900 at the end, a total of 79% gain! You can immediately see the variance drop. The highest returns is no more than 11% and the lowest is no less than 1% return. With the worst days on the stock market removed, we no longer see any returns above 11% so it might be a better representation for what we can expect. The longer our investment horizon, the smaller the variance of returns and it seems to start settling in between 6% and 8% per annum. Really not too shabby if you are going to be invested for the long term anyway. So what are some conclusions we can draw from this? Lump sum investing provided positive returns for all 100% of the investment populations within the last 11 years for investment horizons between 5 and 10 years. The longer we stay invested, the less risk we have on our returns. We were also more likely to achieve a return higher than 6%. If you happen to receive a large amount of money, you can do a lot worse than to just use all of it to buy the STI ETF and just hold it. Remember to reinvest the dividends. I believe that the returns were positive for all of our samples only due to the high dividend payout of the STI ETF, so make sure you’re reinvesting! This is pretty notable since the STI ETF didn’t seem to move much aside from the large drop and recovery during the financial crisis. Yet in the last 11 years, you were very likely to have made a purchase that generated reasonably good returns. This could be attributed to the relatively good dividend payout of the STI ETF which allows us to use it to buy more and more units over time. The longer you hold the shares, the more shares you get to buy using its dividend. However, would we get a better return on average if we split up the lump sum amount into smaller pieces and DCA into the market instead of making 1 large purchase like we’ve done here? We didn’t have time to go into that calculation in this post and we’re already running into more than 200 words, so I’ll leave that analysis to the last part of this series. I hope that this instalment has been just as interesting as the previous ones and that it gives you a better idea on what to expect from the STI ETF even if the past performance does not guarantee future returns. As usual, I’d love to hear your feedback and inputs in the comments below. Please let me know what you liked and which area I should improve on. You can also follow me on twitter @firepathlion and ask me any questions there. I hope you guys all have a happy Chinese New Year 2019!